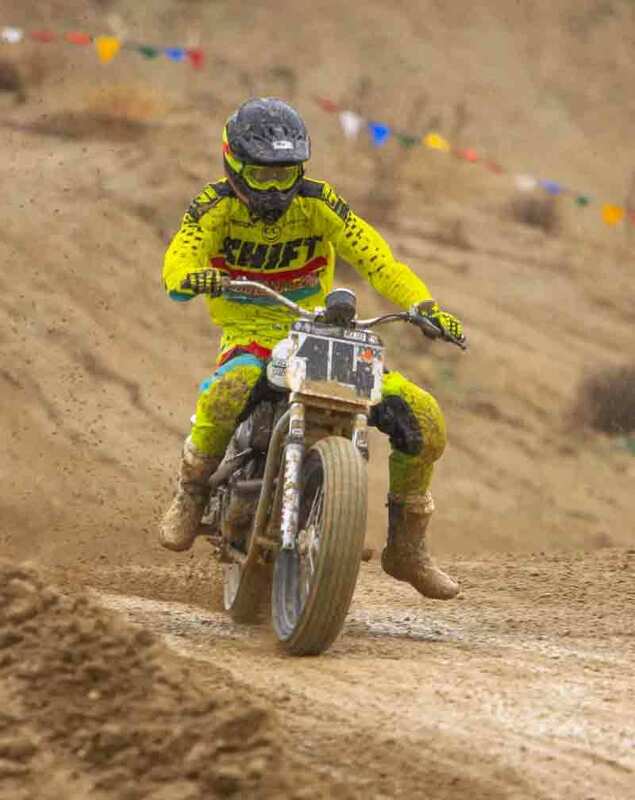 Day in the Dirt is a special "one-off" race every year after thanksgiving, put on by the Hollywood stunt and film industry. This year was the 19th running of the race. 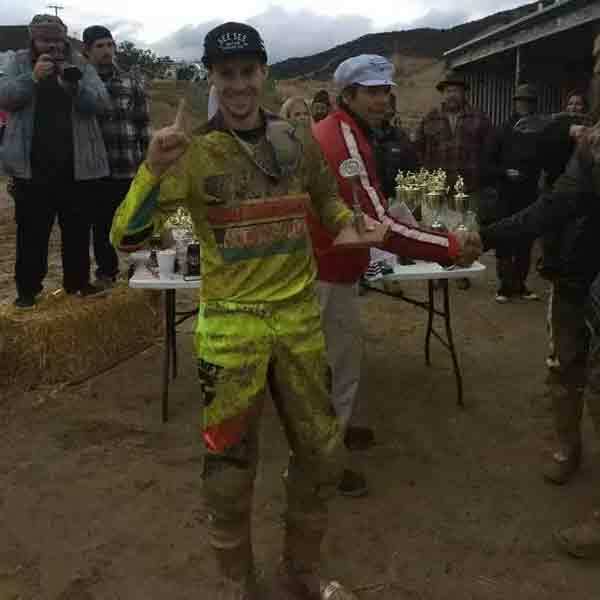 It was hosted at the world famous Glen Helen Raceway in San Bernardino, California on November 25-27. For years it's only been motocross racing, but the newest addition has been TT and flat track racing. I've raced Day in the Dirt (DITD) once back in 2004, I believe I was 10 years old at the time riding a Kawasaki KX65. 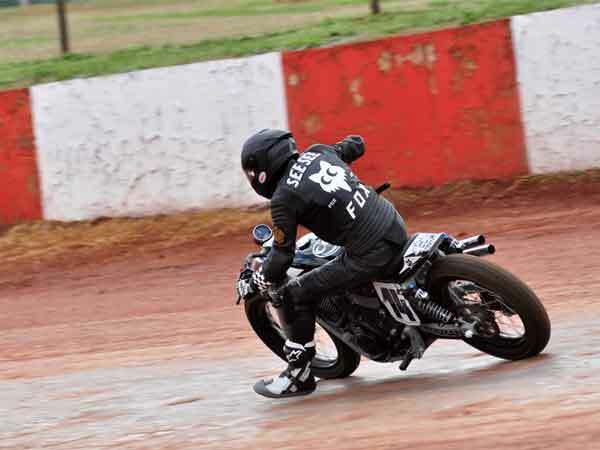 My friend and sponsor, Thor Drake of See See Motor Coffee Co. threw the idea out of me racing DITD on his Harley Davidson XG750 only a few weeks ago. But it wasn't actually until 3 days before the race began that I knew I would be going! On a Tuesday I drove into Portland to load up the hog, and on my way home I thought, "I wonder if I could borrow a motocross bike?" So I stopped in at Bob Lanphere's Beaverton Motorcycles, another sponsor of mine. Sure enough, they loaded me up with a Yamaha YZ250F they had on the used bikes showroom floor. 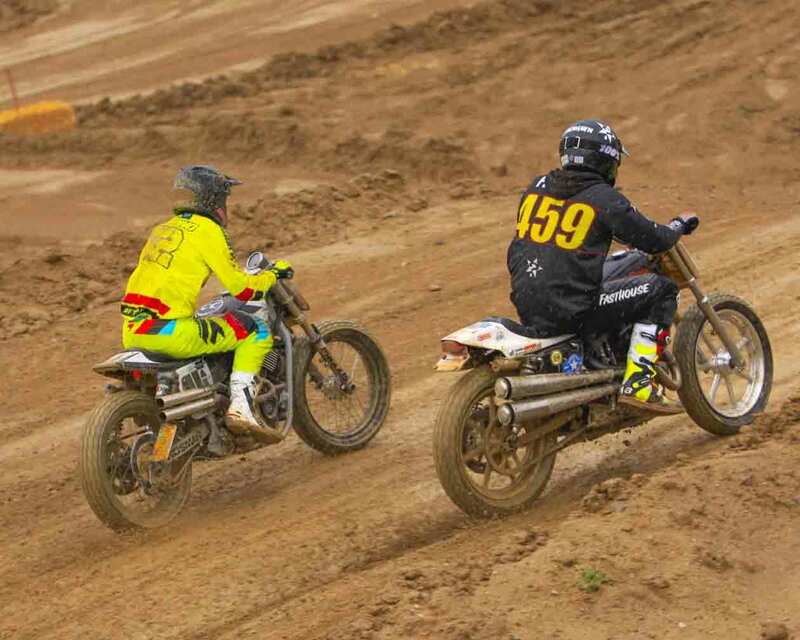 I had a flat track bike and motocross bike and DITD was on! The race weekend began on a Friday, and I still had thanksgiving dinner planned on Thursday with my family. I left dinner around 3pm in Madras, Oregon, and drove 657 miles straight down to Fresno, California to my girlfriend's house. I arrived by 12:30am. The next day I left Fresno at noon for a 275 mile stint to Glen Helen Raceway, where I arrived at 5pm, just in time to set up camp before dark. After setting up camp, I started visiting friends of mine from the PNW. On Friday night, my friend Scott Hart of Moto Stuff mentioned he needed a third man for the Bossa Nova team race that ran Saturday. The next morning I got up early, got signed up, and joined him and Brȍck Powell at the line for the 45 minute race later that afternoon. All motocross races at DITD are flag starts, in multiple waves. In the Bossa Nova race, there were 3 classes: Fast Guys, Moto Industry, and the Movie Industry. We ran in the Moto Industry class, since Scott owns Moto Stuff, a major aftermarket motorcycle brake manufacturer and supplier. 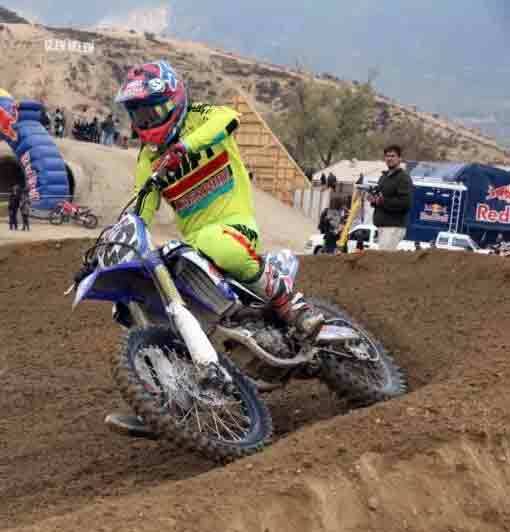 I got a killer start in my wave, fighting for the holeshot with all kinds of pro's and legends. Did I mention, I only got 1 lap on the 7 plus minute track? I was still figuring out where the track went, I got it down after 3 laps, and by then I was just trying to hang out as arm-pump at set in. The track was so rough, chewed up and dry. It was so much fun though, and it was really satisfying when I took the checkered flag. Right after the Bossa Nova, I had to get over to the TT track race that Hell on Wheels was running. I entered in the Super Hooligan class, which is pretty much open to any street legal bike. Most people run big 750cc twin Harley's and Indian's with modifications for flat track racing, but now and then you'll get a Ducati or something even more outrageous in the mix. Now usually Super Hooligan races are only on oval flat tracks. This TT track was basically a "vet style" motocross track connected to the oval. There were table tops, multiple hairpins, right hand turns, and a fast switchback section. There were other races being ran on that track all day, so we had a pretty rough track to start with. 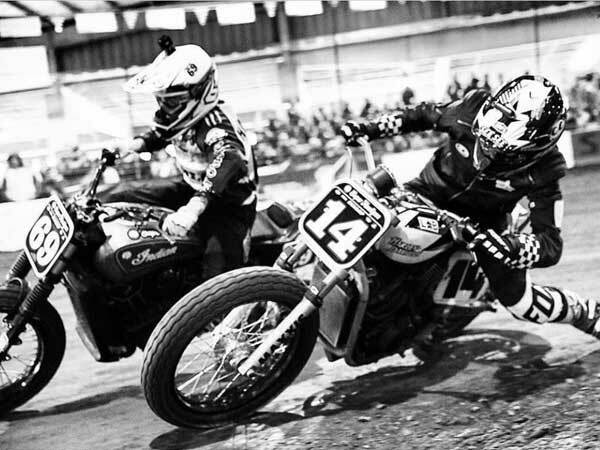 It was nothing like any of the Super Hooligan riders have raced on before! Personally, I was excited. I knew it would play to my motocross experience. The weather was threatening, making it even more interesting potentially. The rain did not let up, and the main event was going to be even crazier. Any normal human being would have decided to sit out the mud-fest on these 400 plus pound machines. But nope, 12 riders lined up side by side for the main event. I knew the start would be everything. Clear vision, control of the race, and out of the chaos. I timed the flag start perfectly, and took the holeshot into turn 1. Behind me bikes roared, crashed, and collided. I did everything I could to just pull away and escape it. Once again, Holden Pruitt challenged me. We came around into the 180-degree first turn once again, which was especially chewed up and slick. I fought to get the bike turned, and Pruitt took advantage with a block pass on me. When the Super Hooligan heat races were up, the rain had set in. Everyone only practiced on a dry track, so the opening lap of the race was going to be a gamble as racers fought for first, while trying not to overstep the bounds of the treacherous track conditions. Lucky for me, I got a decent start and was in 2nd place, and a couple turns in, the rider in 1st place fell, handing me the lead. A lap later, another Harley rider blasted underneath me taking the lead away. I was covered in mud as the leader roosted me, and had to take off my goggles so I could see. Initially the rider, Holden Pruitt, gapped me. But on the final lap, I gave it everything I had to close the gap. With 2 turns to go, I squared him up on the face of a jump, which gave me the drive to pass him into the final turn for the heat race win! Once again I mounted a charge back, and had to ditch my goggles so I could see. Rain and mud covered my body and face, and it was all I could do to keep my eyes clear. This time, Pruitt made a mistake allowing me underneath. I keep the throttle twisted and was able to break away to a comfortable lead. But it wasn't over. Mother Nature was still causing havoc, the track was claiming racers left and right, and nerves were setting in. When the white flag came out, I made my way around the track with caution. When I crossed the finish line, the celebration began! I laid the Harley over in the mud and did donuts in front of the crowd. 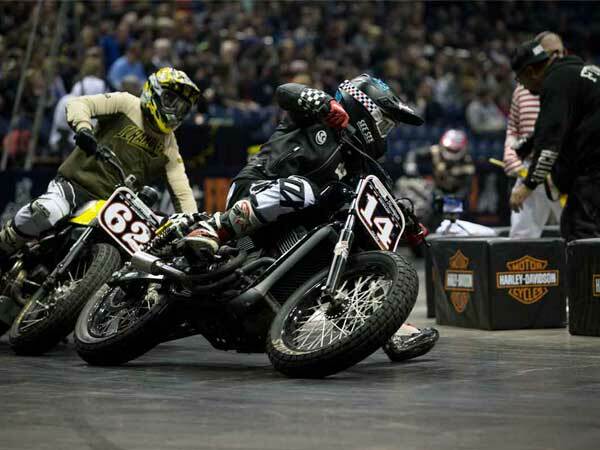 World-famous bike builder Roland Sands handmade the trophies for the top 3 in Super Hooligan, which was very special. After the TT race Saturday, they ended up canceling the flat track oval race. The weather did not let up, and it only got worse. I camped out Saturday night with my friends, and headed back up to Fresno to stay with my girlfriend on Sunday morning. Winning the Super Hooligan race was the goal, and it felt amazing to come that far and accomplish that. 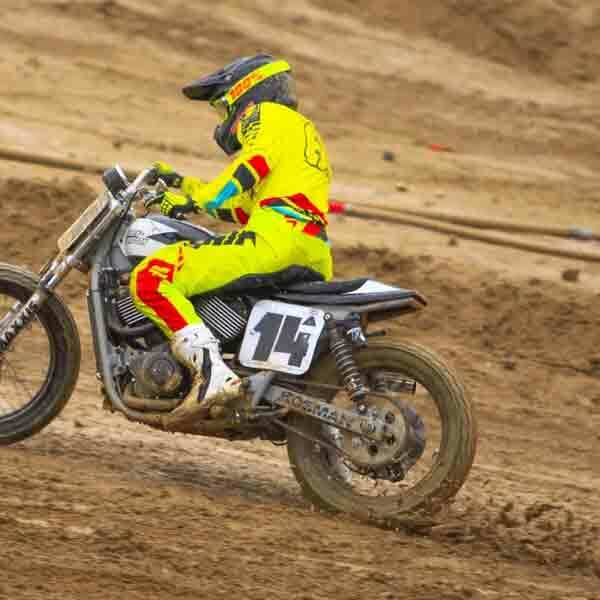 Getting to race motocross was icing on the cake. Like I mentioned earlier, the Harley is street legal. I rode for days in Fresno after the race with my girlfriend who has a Suzuki GSX-R 600! I'm in love with that Hooligan bike, I want my own now! I want to thank Thor at See See Motor Coffee Co for sending me down to race his Harley, and Beaverton Motorcycles for the loaner dirt bike. Without them, I wouldn't have had anything to race! A big thanks to 100% goggles, and Oregon Motorcycle Attorney for the support to get me down to the race as well. It was a blast!